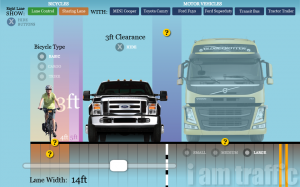 Click the image above to explore lane width in an interactive graphic. In a wide lane, usually a minimum of 14 feet, bicyclists may not ride two abreast and must keep right to avoid impeding other traffic unless travelling at the same speed or greater than other traffic, passing, preparing for a left turn or avoiding any unsafe or potentially unsafe condition. Question Tim asked: Are you allowed to ride double file on a sub-standard lane? Question Marc asked: How do you handle a deputy who tells you that must keep to the extreme right of a substandard roadway or ride on the sidewalk? Question Chris asked: If there are two lanes for each direction of traffic and no bike lanes, may one or two bicycles use the right whole lane?